Well folks, I would just type a bunch of !!! if it would accurately express my feelings toward the Upham’s wedding….but I think we need a little more than that! Jenna and Matthew are so incredible. SO incredible & joyful I could just explode! I met Jenna probably the day I met her sister, who happens to also be my best friend, roughly 20 years ago. 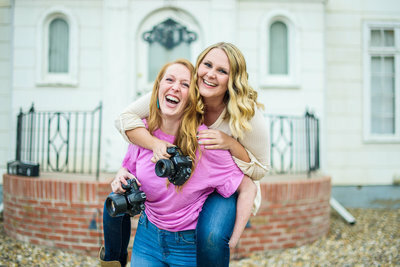 I was lucky enough to spend time with her in high school, explore Spain with her, go on many adventures with her, attend her bachelorette party, and then photograph the biggest day in her life this far! I feel really lucky to be Jenna’s friend & to have witnessed her and Matthew’s great love story! I don’t remember when I met Matt, but I do remember him being the best sport ever during their engagement pictures last fall in Glacier and being the best nuzzler EVER!! You can sneak a peek at their engagement session right HERE if you fancy! Jenna told me on her wedding day about the first time she saw Matthew. He was walking up Guad hill on the Carroll College campus and she was walking down it. She said she noticed him, noticed his handsome face and also how intimidating his face was too! She said she promptly dropped her eyes and continued to walk down the hill. 5 years later Matthew got down on one knee on that same hill on the Carroll Campus and asked Jenna to spend the rest of her life with him! July 22nd, 2017 was a clear blue sky, warm wind, and beautiful day! Jenna and Matthew got married in the beautiful St. Jude’s Catholic Church while all their friends and family sat and prayed with them. I witnessed a couple of great things during their ceremony. One being Matt’s football teammates, his brothers, and best friends, holding hands and celebrating Matt’s union to Jenna during the service. I also witnessed more laughter and joy during that Catholic ceremony than I have ever witnessed before! This day was 100% joyful at all points!! After they were officially Mr. & Mrs. Upham, the 16 person bridal party and the newlyweds hopped on a bus for a celebratory cruise! More laughter & lots of memories were made on that bus! They then joined their guests at Prairie Farms Golf Course to dance the night away! After delicious food, amazing toasts, the best dancing, and the greatest 24 hours spent with the best people, Jenna and Matt were married! My cheeks are still a little sore from smiling and rejoicing so much last Saturday, but it was definitely worth it to see one of my good friends walk hand-in-hand with her love toward their legacy of THE UPHAMS!!! Congratulations, Jenna & Matt! I love you guys! Also, #mccannigetathumbsupham might be my favorite wedding hashtag EVER!